Harrisburg, PA – Governor Tom Wolf today signed House Bill 1175 into law, now Act 2 of 2018, renewing his commitment to change the culture of Harrisburg and make state government more efficient and transparent. The legislation, introduced by Rep. Bryan Cutler with bipartisan support by former Rep. Brandon Neuman, passed unanimously in the House and Senate. It strengthens restrictions for lobbyists and special interests and improves efficiency by requiring lobbying disclosure reports to be filed electronically with the Department of State. 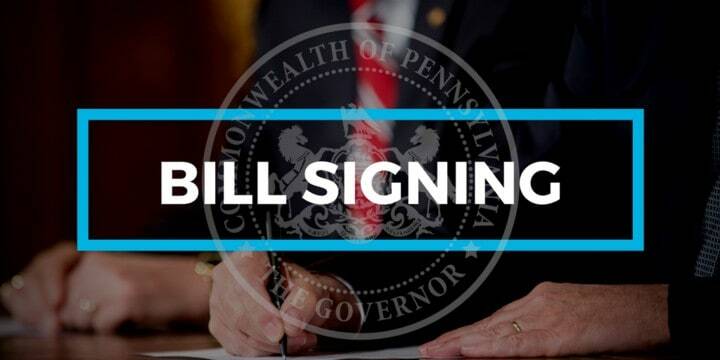 “I am proud to sign this bill, which is long overdue,” said Governor Wolf. “By cracking down on special interests, this bill will help to create a more open, honest and transparent government in Harrisburg that is accountable to the people of Pennsylvania. Requiring the Department of State to post all lobbying disclosure reports online within seven days of receiving the filing. The department typically posts electronically filed reports within minutes of submission. The new penalties take effect immediately and the electronic filing requirement takes effect in 60 days. The governor donates his salary to charity. Gift ban for all employees under the governor’s jurisdiction. Cabinet secretaries must post their expenses online each month. Eliminated more than $2 billion in government waste from the state budget and consolidated agencies. Comprehensive pension reform reduced risk to taxpayers as Pennsylvania continues to pay down the debt and slash Wall Street fees. Liquor system modernization to allow gas stations to sell beer and grocery stores to sell wine, as well as increasing hours at state stores and legalizing shipments of wine to people’s homes.